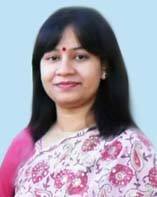 Keya Rani Das is a faculty member of Department of Statistics, Bangabandhu Sheikh Mujibur Rahman Agricultural university(BSMRAU). Currently she is serving as an Assistant Professor of this university. She has completed her M.Sc in Statistics and B.Sc major in Statistics from the University of Rajshahi, Bangladesh. She has some national and international publication with high indexing research articles to her credit. Sampling Technique, Experimental Design, Statistical Quality Control, Bioinformatics. ● 2010, Master of Science (M.Sc.) in Statistics (Thesis group), University of Rajshahi, Bangladesh. ● 2009, Bachelor of Science (B.Sc.) Honours in Statistics, University of Rajshahi, Bangladesh. ● Assistant Professor, Department of Statistics, Bangabandhu Sheikh Mujibur Rahman Agricultural University, Salna, Gazipur 1706, Bangladesh. Since July 2014 to date. ● Lecturer, Department of Statistics, Bangabandhu Sheikh Mujibur Rahman Agricultural University, Salna, Gazipur 1706, Bangladesh. Since July 2012 to July 2014. ● Assistant Provost (Cultural Affairs),Bangabandhu Sheikh Mujibur Rahman Agricultural University, Salna, Gazipur 1706, Bangladesh. Since March 2018 to till date. ● House Tutor ,Ila Mitra Hall,Bangabandhu Sheikh Mujibur Rahman Agricultural University, Salna, Gazipur 1706, Bangladesh. Since July 2012 to July 2014. ● Scholarship from Board of Intermediate and Secondary Education of Rajshahi, Bangladesh in Bachelor of Science (Honours) level from 2006 to 2009. ● Bangladesh Scholarship Council and Nippon Foundation, Japan on outstanding academic achievements for 2008-2009. ● Bangladesh Scholarship Council and Nippon Foundation, Japan on outstanding academic achievements for 2007-2008. ● Presented a paper on Implementation Challenges of Primary English Curriculum in Hill-areas of Bangladesh, in the 21st International Conference of NELTA, Organized by Nepal English Language Teachers’ Association, Nepal, on 7-9 March, 2016. ● Presented a paper on Measurement on Variability between Area and Production of Pulse in Bangladesh, in the 2nd International Conference on Theory and Application of Statistics, Organized by Dhaka University Statistics Department Alumni Association, 27-29 December, 2015. ● Presented a paper on Two Efficient Estimators for Small Areas in the International Conference on Statistical Data Mining for Bioinformatics, Health, Agriculture and Environment, Organized by Department of Statistics, Rajshahi University, 21-24 December, 2012. ● Participated in the Strengthening Pedagogical Skills of Young Teachers, organized by Faculty of Agriculture and International Affairs Office, Bangabandhu Sheikh Mujibur Rahman Agricultural University, from December 30, 2015 to January 2, 2016. ● Attended a training and workshop on ‘Experience Sharing: Course Credit System of Bangabandhu Sheikh Mujibur Rahman Agricultural University, organized by Bangabandhu Sheikh Mujibur Rahman Agricultural University, June 10-12, 2014. ● Attended to Bioinformatics Workshop-01, organized by the Department of Statistics, University of Rajshahi on , March 23-24, 2012. ● Participated on Reproducing Kernel Hilbert Space and Its Applications ,organized by the Department of Statistics, University of Rajshahi , February 24, 2012. ● Participated on Multivariate Calculus for Machine Learning,organized by the Department of Statistics, University of Rajshahi , November 25-26, 2011. ● Participated to the Matrix Analysis and Their Applications in Statistical Learning Theory, organized by the Department of Statistics, University of Rajshahi on ,October 30-01 , 2011. ● Attended a training on Probability Theory and Applications in Machine learning which was organized by the Department of Statistics, University of Rajshahi , September 09-10 , 2011. ● Participated to the on Calculus I for Machine Learning which was organized by the Department of Statistics, University of Rajshahi , 28-30 July 2011. ● Life Member, Bangladesh Association for the Advancement of Science, Bangladesh. ● Life Member, Rajshahi University Statistical Association (RUSA).